Kitty and I have been working on our Pâte à Choux recipe for years, making an effort to perfect our method in creating a good pastry. We have tested our recipe using different flours; changing the ratios of milk and water; and playing around with egg washes and sugary toppings. We discovered that a good balance of ingredients, a generous amount of eggs, and a healthy dose of mixing gives choux their characteristic puff. In a saucepan, combine the water, milk, butter, sugar, and salt. Put the pot on a low flame and melt the butter. 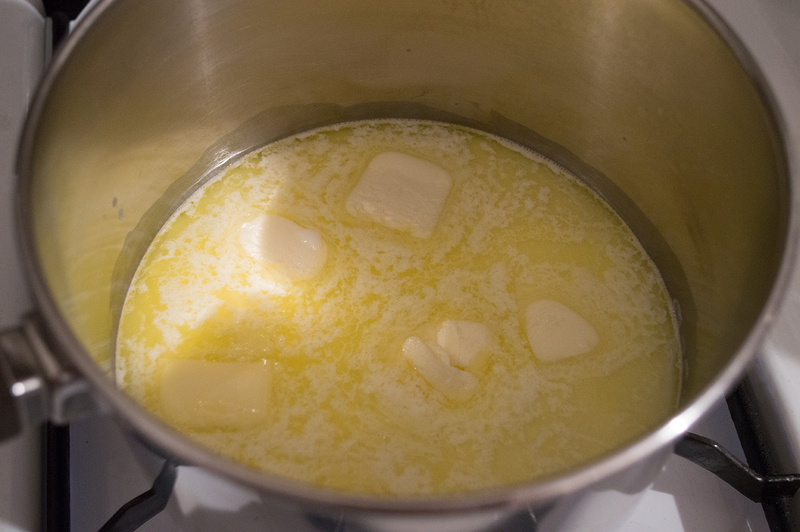 Once the butter has melted, bring up the flame to medium and boil the mixture. Take the pot off the heat, pour in the flour, and stir the dough vigorously with a whisk. Bring the pot back to the flame and cook the dough on medium-high flame, stirring continuously, until a film develops on the bottom of the pot and the dough clumps together as one, about 3-5 minutes. 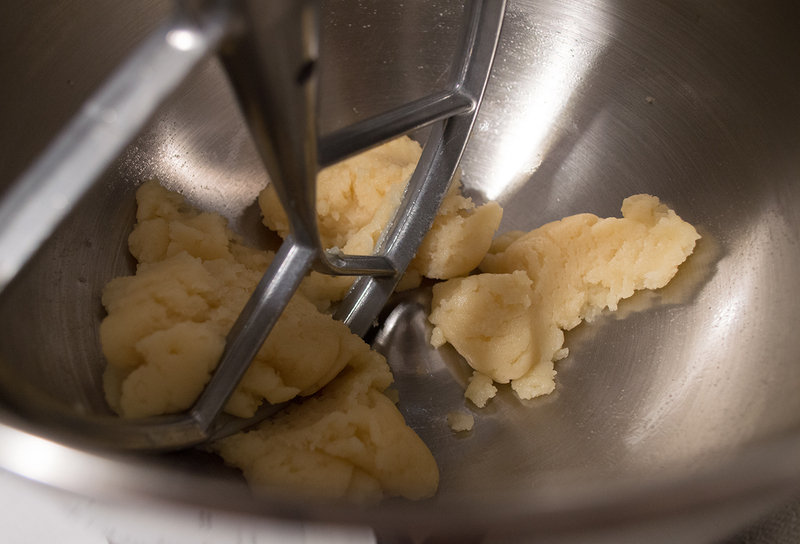 Turn off the flame and flip out the dough into a stand mixer bowl (or a regular mixing bowl). 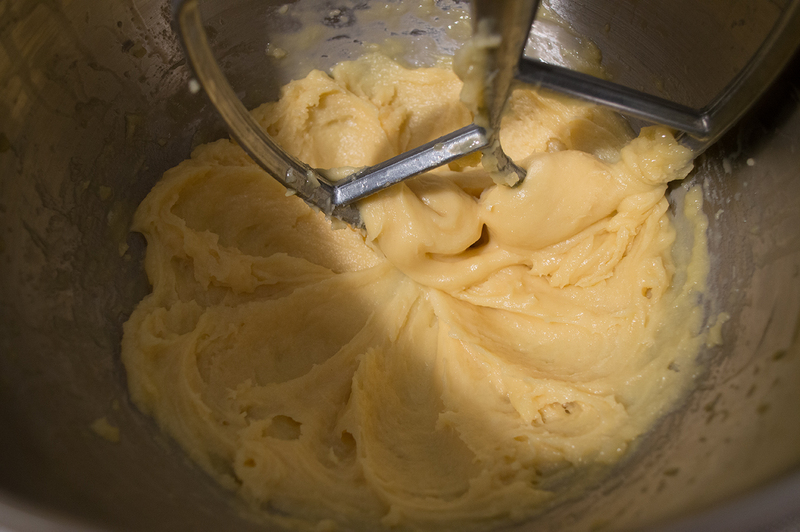 Using a paddle attachment, mix the dough on medium speed (if you're using a standard mixing bowl, stir with a spatula). When the dough stops steaming, begin adding your eggs. Crack all three eggs into a small bowl. 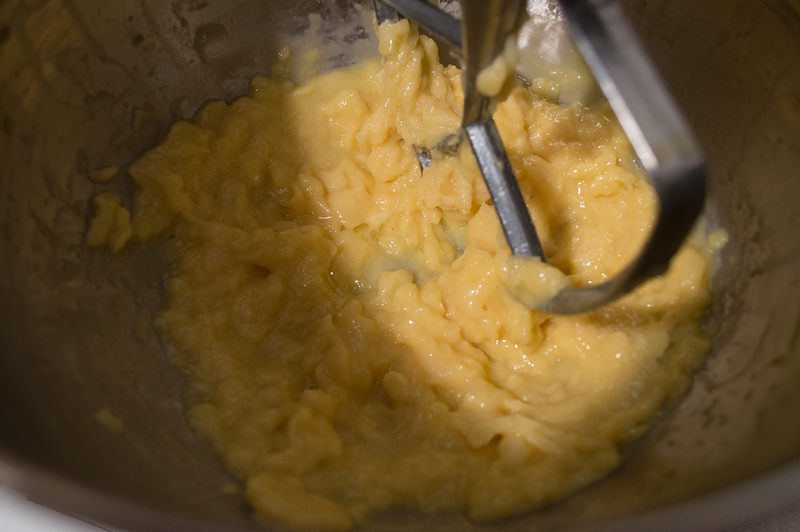 Add your first egg and mix thoroughly, before adding your second egg. 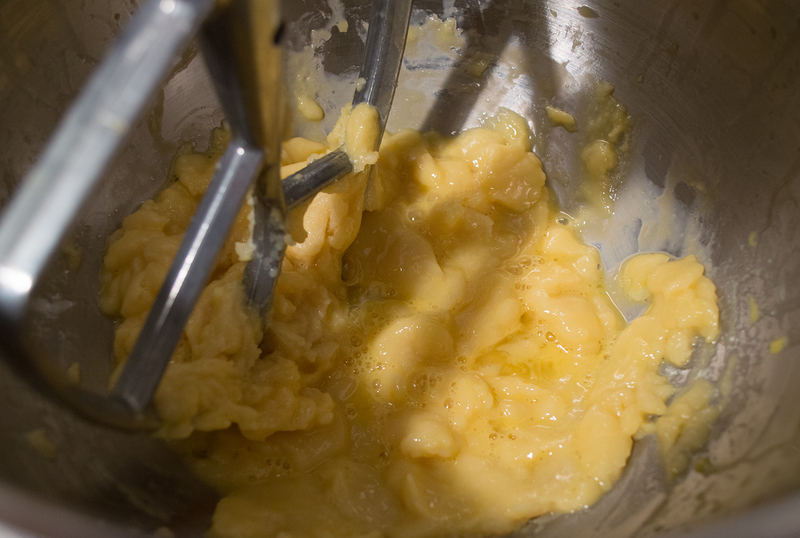 For the third egg, whisk and add half the egg, then test for consistency. 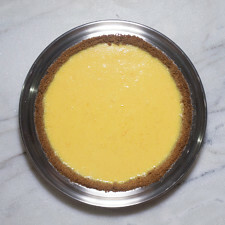 If the mixture is thick, add the rest of the egg; otherwise, leave out the half-egg. 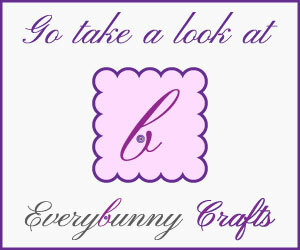 Test the consistency once more. 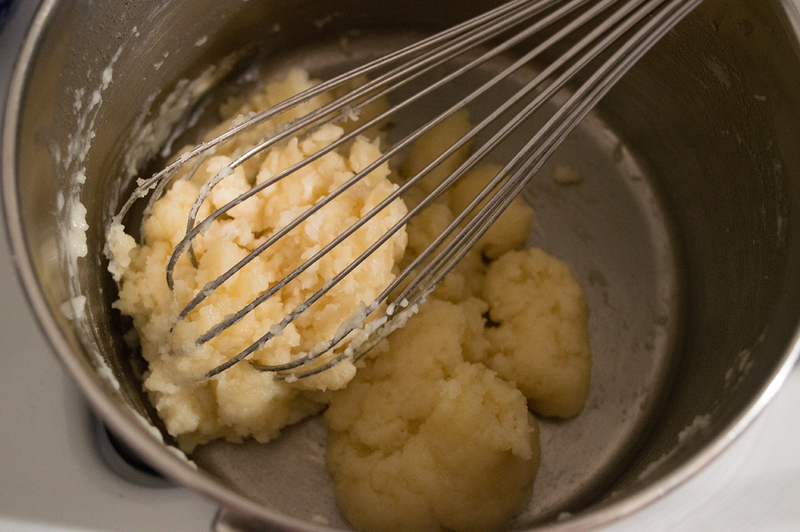 You may or may not need another whisked egg. Preheat your oven to 375°F (190°C). Prepare two sheet pans with parchment or silpats. Scrape all of the dough into a piping bag fitted with a #5 round tip. Pipe out domes 1½ inches in diameter, a little more than an inch apart. 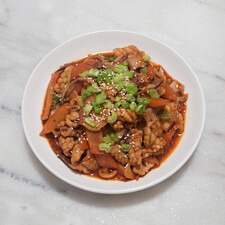 Place the croustillant on top. Bake at 375°F (190°C) for 15 minutes, then turn down the oven to 350°F (177°C) and bake for another 20-25 minutes, or until the dough is golden brown throughout. Remove from the oven and cool completely before filling and decorating. If any of you guys have come across a bunch of pâte à choux recipes, you'll notice that they're all relatively the same. Some only use water, and others use a mixture of water and milk. I like a bit of milk in mine to create a more tender dough. It's ideal to melt the butter slowly in the saucepan before bringing the heat up to boil, because you don't want to lose all of the water content before you add the flour. 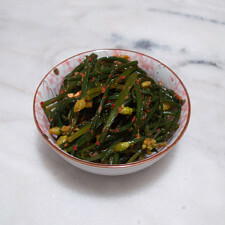 As you are stirring the mixture in the saucepan, be sure to not over-cook the dough, as it can turn a bit red when baked. It's important to wait to add the eggs; we don't want the eggs to cook in a hot dough. Stirring or paddling the mix helps cool the dough faster. Consistency depends on how much moisture is in the air, how much we cook the dough on the burner, how much water content is in the egg, what amount of water evaporates while the dough is cooling... yes, it all factors into how much egg goes into the mix. I wrote *3 eggs* because I typically use all 3 eggs. Sometimes, you might find that you need an extra bit of egg, or that last half an egg isn't needed. Use your discretion, though, I have a few ways to help you determine if your mixture is ready for piping; check the photos down below for some of the visual cues (trenching; checking for glossy sheen; smooth, but still can hold shape). 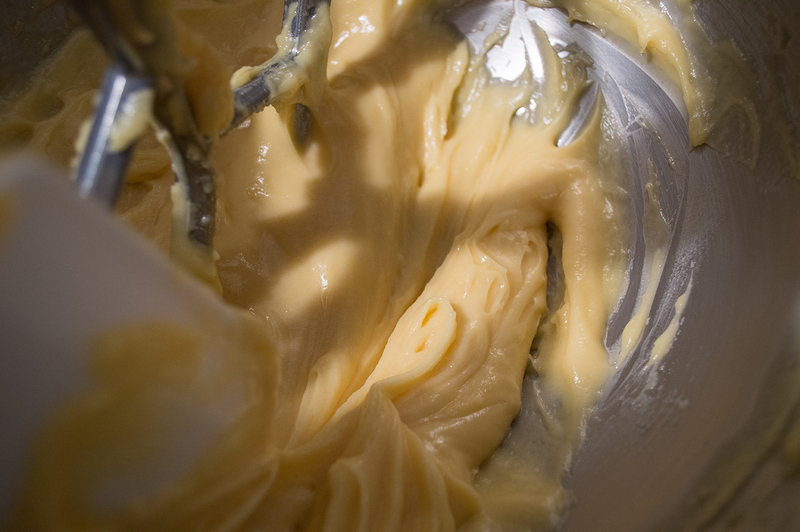 Another method that I often use is the way the paste falls off of the spatula/mixer paddle: once a dollop has fallen from the spatula and back into the bowl, the remaining paste should form a shape like a "V". 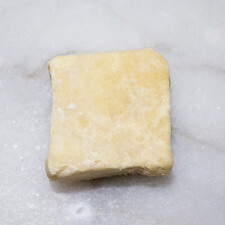 If your parchment rolls, pin the edges down by adding a tiny dot of dough on the underside of each corner. 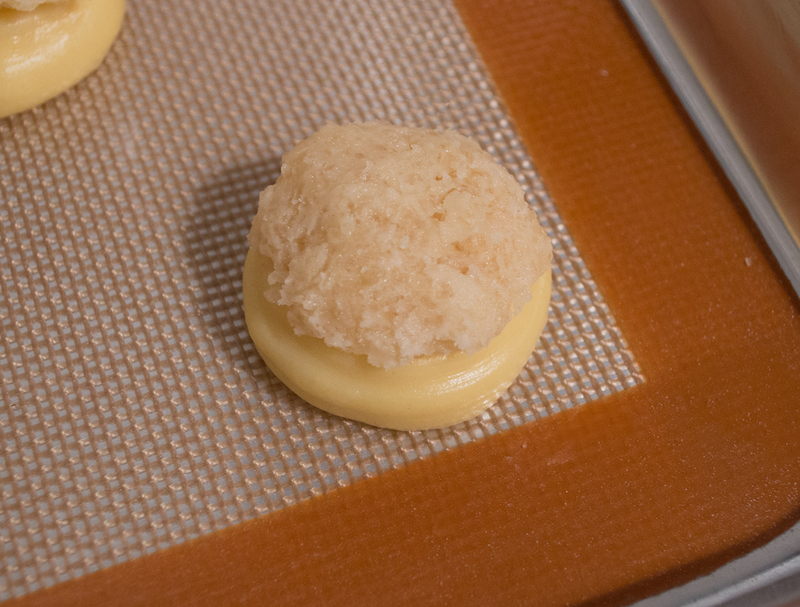 Plus, if you're making smaller choux, use a smaller piping tip. If you are piping éclairs, use a starburst tip, as that helps in keeping the shape and integrity of the éclairs. 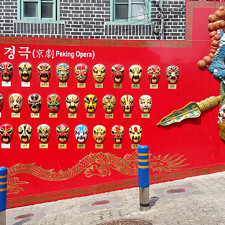 Those need to be piped to roughly 4½-5 inches in length. 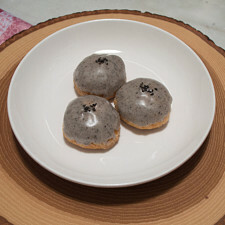 Croustillant isn't a requisite, but they do make for a prettier (and yummier, in my opinion) pastry. You can use a light egg wash if you don't end up using a cookie topping. 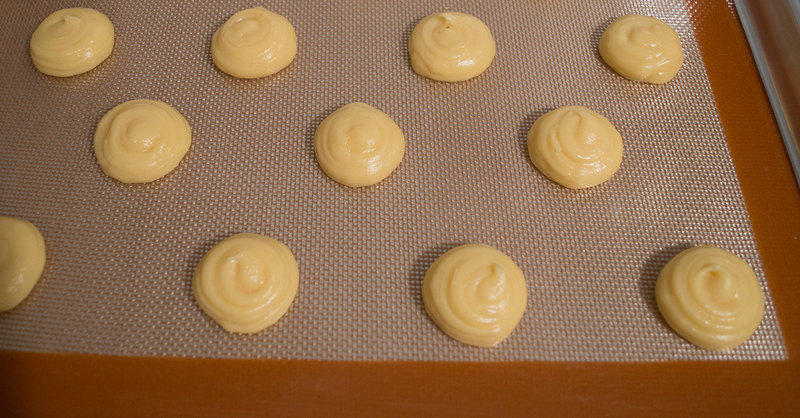 Make sure your choux are golden along the cracks; any under-baking or left over moisture can deflate them. Try and prevent having eggy insides. 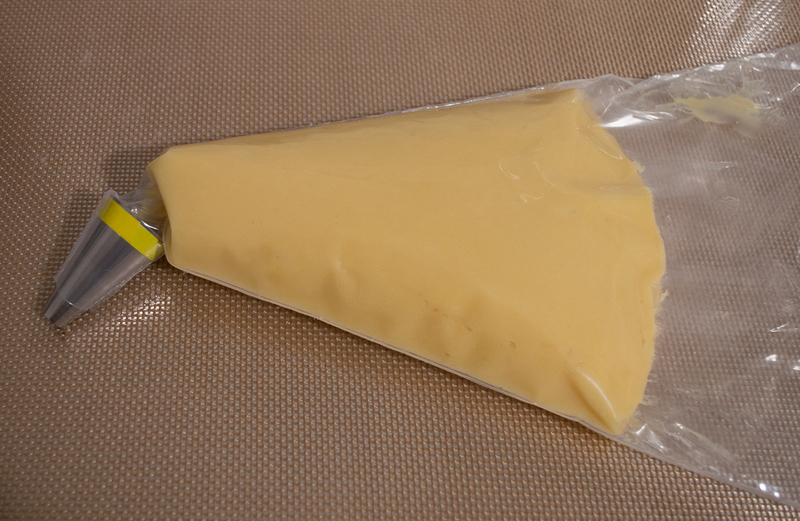 You can freeze the dough or the baked choux: pipe out your desired shapes onto parchment, pop the pan into the freezer until solid, then peel them off and seal them up in a zipper bag. Take them out, lay them on a sheet pan with parchment, and bake from a frozen state. 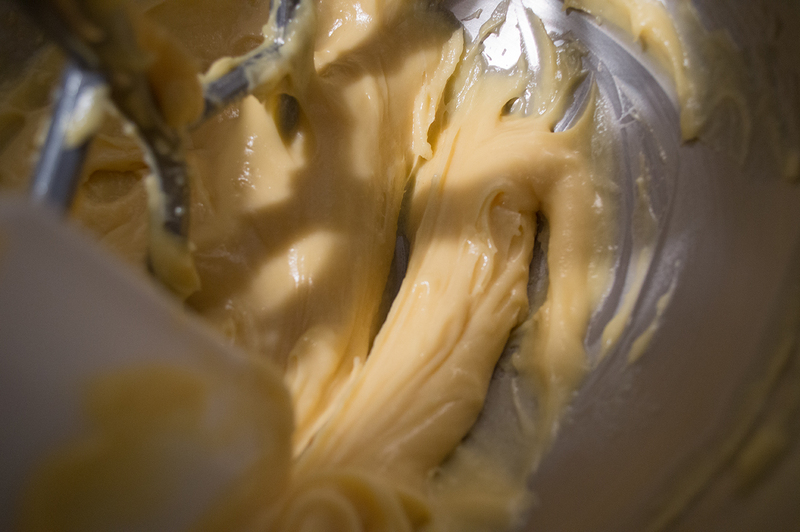 If you decide to bake then freeze, cool them completely before storing them away in a sealed container. Made our Recipe for Pâte à Choux - Choux Pastry? Slowly melting the butter without evaporating the water. 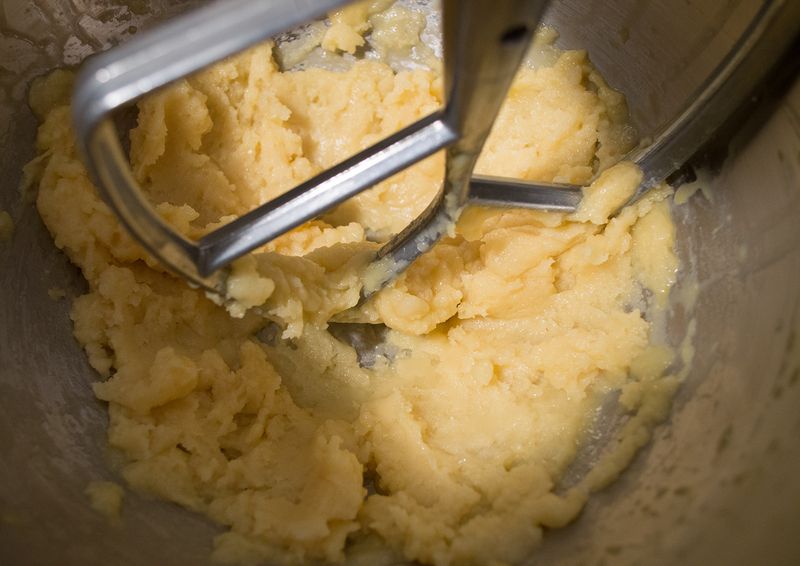 Freshly mixed in flour, which has gelled into a paste. A film has developed at the bottom of the pot, and the dough is coming together. Cooling the dough in the stand mixer bowl. First egg is in the bowl. Second egg thoroughly mixed in, but the mixture is still broken, dry, and matte. Part of the third egg has been combined, and it is becoming more glossy. The dough is finally the right sheen and texture. I decided to use the trenching method to test the dough. I slide my spatula through the paste, and see if the mixture comes back together to close the gap. Within a few seconds, the gap closes, letting me know that the mixture is ready for piping. You can also test the consistency by lifting the spatula or mixer attachment to see if the dough falls off from it in a *V* formation. I have filled the piping bag with the tip end twisted shut, to make sure the paste doesn’t squeeze out until I’m ready to use it. Piped choux. Make sure to pipe dollops at a slightly raised height, so the dough can fall and pool onto the parchment or silpat. 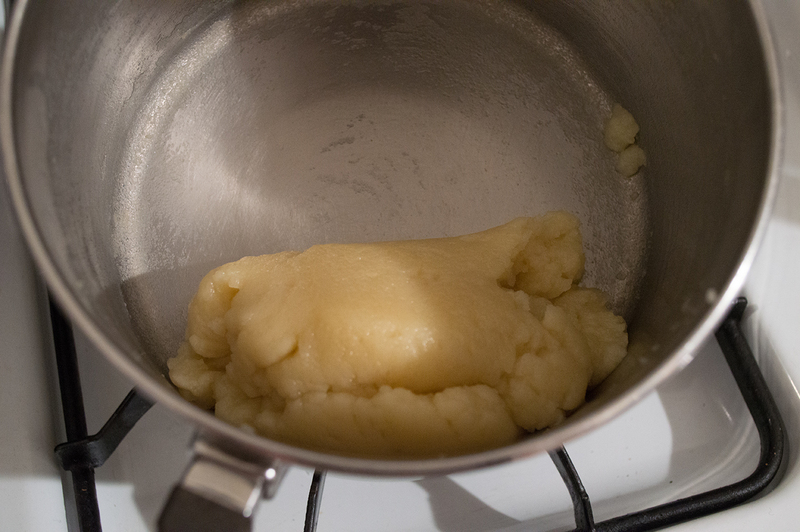 If the dough is piped with pressure against the pan, the choux will dome on the bottom, or they will bake flat. 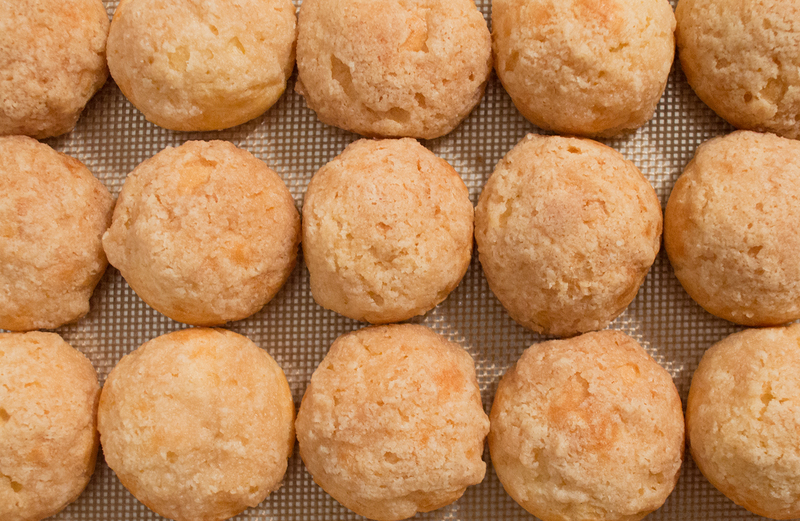 No thoughts on "Pâte à Choux – Choux Pastry Recipe."